General Motors was certain the V8 engine would go the way of the dodo in 1990, according to Hot Rod. So, we almost got a mid-engine Corvette decades ago, only this version also would have had another engine in the front. Best of all, the test mule for this wacky twin-engine Corvette was a humble 1985 Citation X-11. 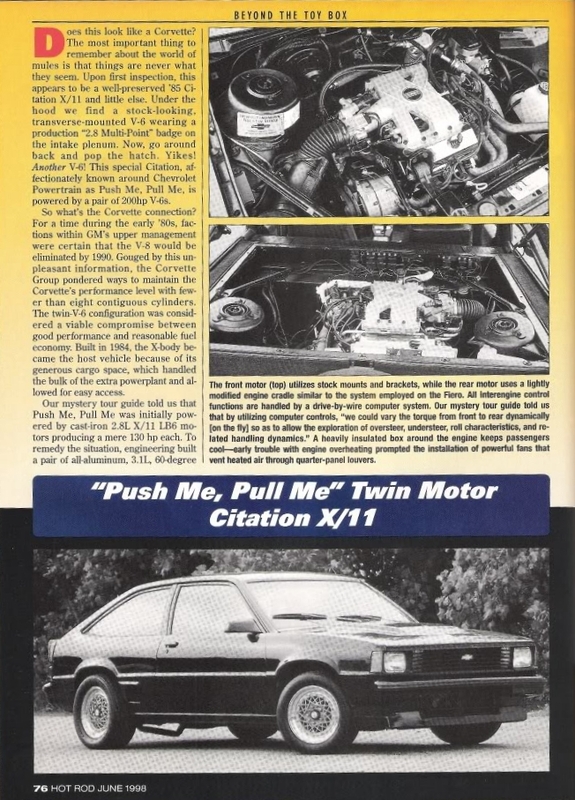 This is the “Push Me, Pull Me” Chevrolet Citation X-11 test mule, which according to the description on dangrus4080's YouTube playlist of the car, lived on thanks to a wacky Floridian named Robert Cope. The Chevrolet Citation was the poster child for my rant on protectionist policies the other day—a primo example of uncompetitive Americana. Because of this, however, I have an undying respect for anyone crazy enough to keep the odds and ends of the vehicular landscape going, despite strange designs, ideas that never caught on, and in this case, the wildly experimental nature of it all. 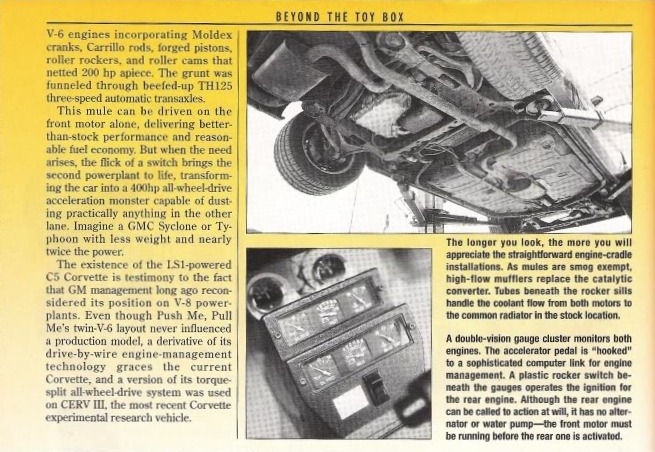 As noted in Elhigh’s passionate defense of the car in the comments of that article, the X-body Citation itself was a daring new design for GM to begin with—and that was before stuffing two aluminum 3.1-liter V6 engines into it. Each engine in this experimental car cranked out 200 horsepower, and the loud dual engines sound truly ridiculous coming from one little hatchback. The dual-engine X-11 mule could be powered by only the front engine driving its front drive wheels, however, with the flip of a switch, the rear engine could be fired up to power the rear wheels, transforming the car into a 400-hp, all-wheel-drive monster. “Imagine a GMC Syclone or Typhoon with less weight and nearly twice the power,” Hot Rod said of the car. That being said, we’re glad for simplicity’s sake that GM decided not to axe the V8. The under-hood view of the modern-day C7 is a work of art. Hot Rod’s old feature on this test mule can be read here: Page 1, Page 2. So You Want a V8 X-11 Citation?